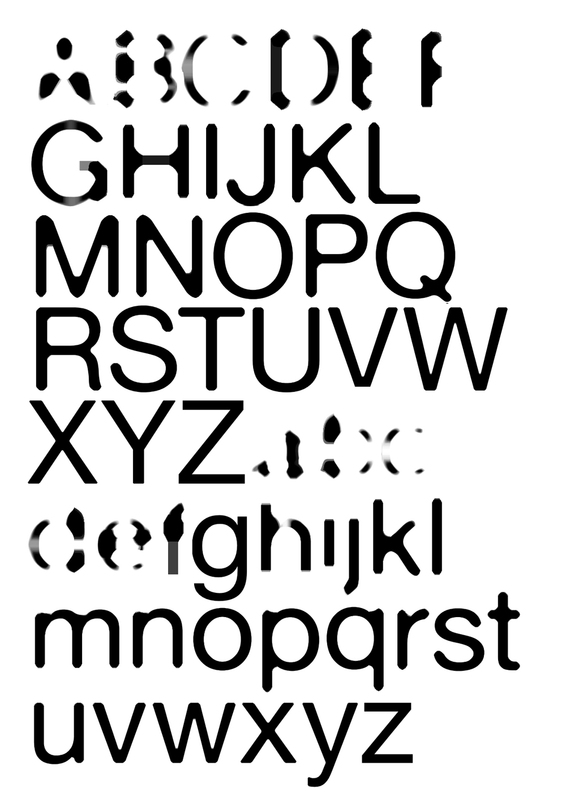 I have been distorting typefaces through controlled iterations. This relates to the work I had done in Unit 1 on generative systems. I am interested in how far a typeface could be systematically distorted and still retain its identity and, more interestingly, how it might still communicate its ‘meaning’. My initial visual tests distorted, in controlled iterations, different typefaces, to see what would happen if familiar faces such as Helvetica or Times Roman are thickened by adding strokes around their body or put through various filters in Photoshop. The results were both predictable and surprising: a typeface loses its identity as soon as it is altered. 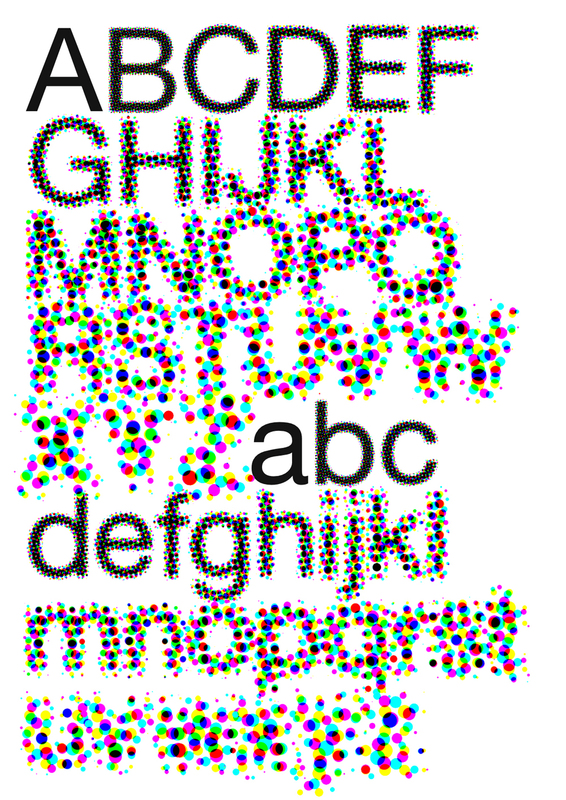 ‘Blurred Helvetica’ is no longer Helvetica, ‘Fat Times New Roman’ is no longer Times New Roman because all the elements that make that typeface look like that typeface – and carry its ‘meaning’ disappear (although some traces remain) as soon as it is changed. However, some of the changes that occurred were surprising: Times New Roman looks like an Egyptian slab serif when it is ‘fattened up’. More interestingly, certain words take on a ‘spiky’ appearance; this transformation, however, is not consistent with other similar typefaces: Baskerville, for example, does not behave in the same way as Times New Roman and Garamond behaves differently again. On the advice of Paul, I researched other people who had manipulated typefaces. 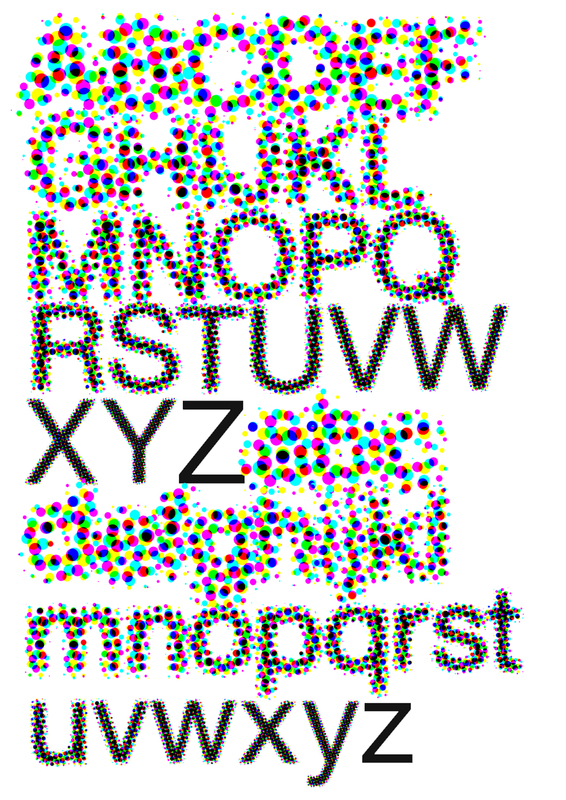 Caroline Fabès www.carolinefabes.com has systematically manipulated Times New Roman and Akkurat to create new glyphs that share the same number of pixels as the original typeface but re-arranges the pixels in one of four different ways. She has called her new typefaces ‘Times New Ramon’ and ‘Akkruat’ an in-joke reference to the source typefaces. 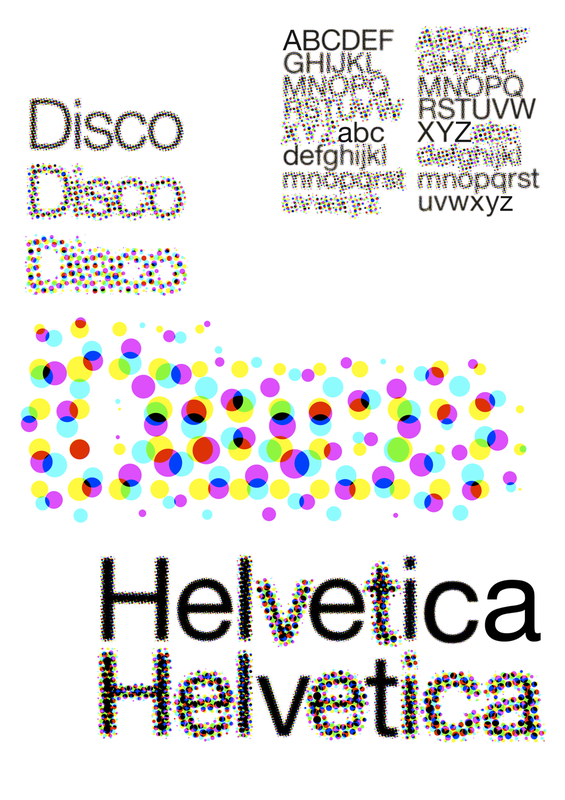 Similarly, Norm (Manuel Krebs and Dimitri BruniI) have created new typefaces including Normetica (2000) and Replica (2008) that are a response not only to ideas of neutrality, looking at ‘neutral’ typefaces such as Helvetica and Univers, but also to the technology available to create typefaces. This is my workspace. To the left is the area where I cut and paste in the real world, to the right is the area where I cut and paste in the digital world. Macabre note: the ashes of my dog, who died in the summer, are in a box under the desk. It's comforting, and somehow appropriate that he should still be at my feet. My project will look at the relationship between language, text and typography. It will ask the question: Is it possible to make typography that enhances the content of a text in a manner that is functional i.e. legible and readable but that does not resort to superficial visual tricks to amplify meaning? This is not a project that aims to re-hash post-modern ideas about the fluidity of the text - although I do propose to survey typography by Rudy van der Lans, Catherine McCoy and April Greiman - rather it will attempt to create a way forward that unites text and typography to reinforce meaning. The texts I intend to use will be chapter-length, continuous texts. I hope to gain a greater understanding of the nuances of typography and of the relationship between language, the written word and type. I hope to be able to further the polarised debate that dichotomises Modernist typography against post-Modern typography. The project will be of interest to typographers and designers. I have been thinking about how visually-literate readers respond to texts, particularly continuous texts, and how typography could be used not only to amplify meaning but to animate the reading experience. This could be beneficial not only to readers but to publishers who may target visually literate readers with enhanced texts. My interest in typography is informed by my background as a fine artist. 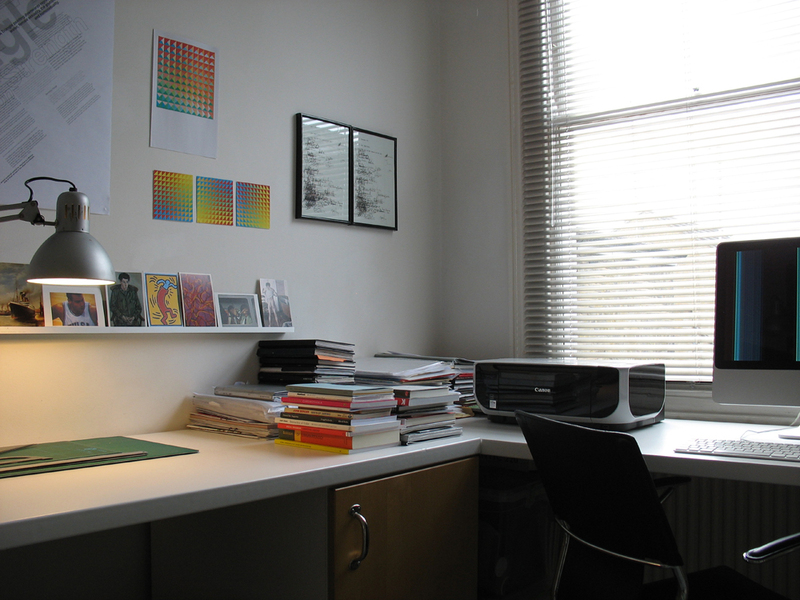 I am interested in how type is used within fine art practice, in the works of Ed Ruscha and Peter Blake for example and, more particularly, within artist’s book production, in publications by Liam Gillick, Jérôme Saint-Loubert Bié and Adam Chodzko. This project will enable me to work more closely with artists to realise their ideas through typography in books and other media. My previous research has looked at the dichotomy between ‘neutral’, ‘transparent’ typography, rooted in Modernism and ‘expressive’ typography, based on post-moderrn thinking. I have been thinking about the idea of typography as a kind of mark-making akin to drawing or painting, and I’m interested in how mark-making - created through subtle modulation of type - can enhance the reading of a text. In Unit 2 I have designed text pieces that attempt, through a variety of typographical means, to generate new meanings within short texts. These testing grounds have take the form of A1 posters and as more experimental text pieces that have appeared on my blog. I have been reading Orality and Literacy by Walter Ong and have been particularly fascinated by the role of repetitiion, in non-writing cultures, as an aid to memory - this book has been a great starting point for thinking about the relationship between between language, text and typography. On Typographic Signification by Gerard Mermoz has helped crystallise some of my ideas and has pointed the way to further reading and research. Bridget Wilkin’s essay Type and Image has been a useful starting point for thinking about the potential for typography to exist in spaces outside of the modernist grid. Of Grammatology by Derrida is next on my reading list, followed by The Alphabet versus the Goddess by Leoanard Shlain. 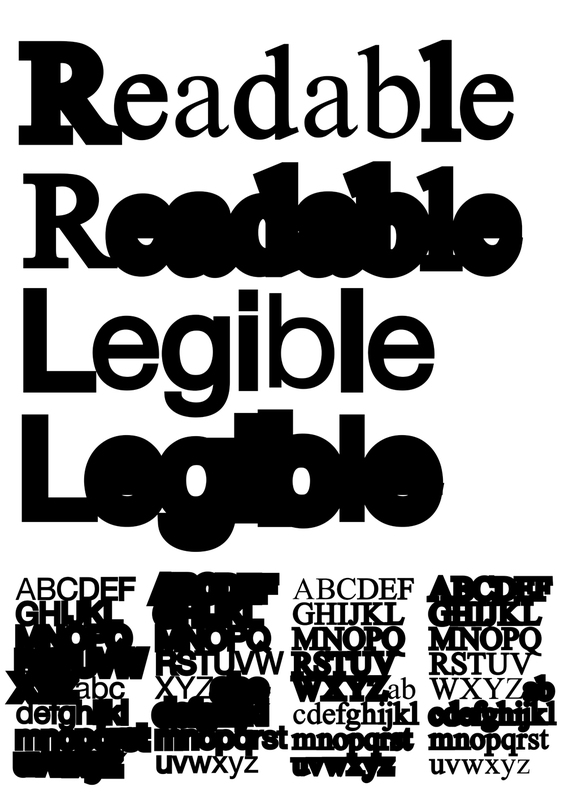 I am re-reading Detail in Typography by Jost Hochuli, Designing Books by Jost Hochuli and Robin Kinross and The Form of the Book Book by Sara De Bondt & Fraser Muggeridge are all useful for thinking about formal ideas of book typography. There is no shortage of books that look at my area of research. However, I think I need to keep my reading focused and would welcome suggestions of ways forward. This project has a practical application so I will conduct a series of applied explorations that will demonstrate my ideas. In addition, to contextualise my practical work, I will undertake an overview of work that has used typography to affect a similar outcome. At the moment, I am not sure that I will answer the question that I have set and although I can see a route that the research might take, my outcome remains vague. My area of study is the detail of typography so, the only certainty (which, of course, is not certain) is that my outcome will be typographic in some form. In an essay called ‘On Typographic Signification’ Gerard Mermoz questions the dichotomy between transparent/neutral and ‘expressive’ typographies. He suggests a new strategy for thinking about the “functional interaction between typography and text.” Mermoz looks at two examples of typographic work that represent “typography as an authoring device and as an intervention on the text and typography as a design tool working on the external form and visual configuration of the text, irrespective of its content.” Mermoz further categorises these strategies in terms of ‘designing from within’ and ‘designing from without’. In contrast to authorial typographic interventions or ‘designing from within’ Mermoz looks at ‘Cranbrook Design: The New Discourse’, published in 1990, as an example of external typographic interventions. Mermoz argues that these interventions do not engage with the text but at the level of their visual appearance. These devices are meant to “challenge the readers’ expectations by disrupting the flow of the text” but Mermoz argues that they do little to intervene at the level of the text.